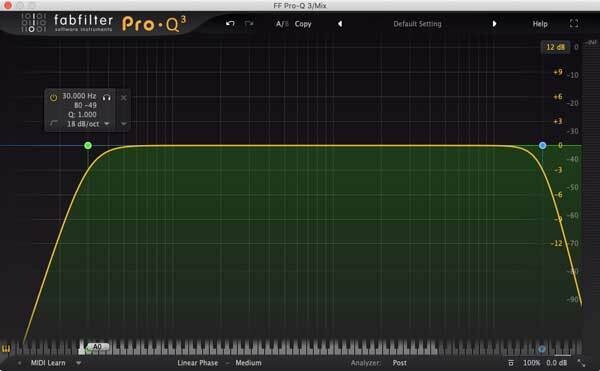 There are some simple EQ techniques you can use to provide increased clarity to your mixes. The stock EQ that comes with your DAW will be able to perform a variety of processes, so upgrading to a more expensive EQ isn’t a requirement. More advanced EQs will provide you with access to extended ease-of-use features, and potentially refined sound quality due to an assortment of processing modes. Making room for the bass in a mix often requires you to affect elements other than just your bass. All of the components of your song interact with one another, meaning that if there’s a buildup of bass content between your vocals, synths, guitars, and pads, there’s a greater chance that you’ll run into potential phase issues in your low-end. Learn how to create punchier songs using phase alignment. 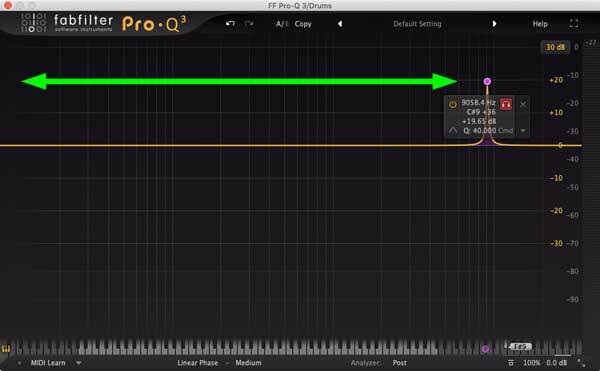 With an EQ like the FabFilter Pro-Q 3 you can apply a high pass filter to remove the low-end frequency content from song elements that have no business creating sub frequency content; this will open up space in the bottom end of your mix and really allow your bass to breathe. I should warn you that cutting away too much low-end from different tracks can make your songs sound hollow, as if there’s a gap between your bass and the rest of your song. Apply this mixing technique in moderation; a little goes a long way. Figure 1: An EQ applying a high-pass filter with an 18 dB/octave slope at 87.307 Hz. There are no rules when it comes to mixing, but I definitely recommend you keep the slope of your high pass filters quite gradual; this will help you avoid creating an inorganic divide between the low-end and top-end of your music. You'll hear people say “cut everything below 100 Hz,” but some instruments rely on this frequency content. It’s ok for some low-end frequency overlap to occur; you need to trust your ears here and think about where the power of the sound you’re sculpting comes from. Many male vocals rely on frequency content around 100 Hz, while lots of female vocals can be cut at 150-200 Hz. Some instruments like electric guitar may even rely on frequency content down to 60-80 Hz; it depends on what else is happening in your mix and how you’re choosing to fill space within your stereo field. Hardware units and plugins can respond to frequencies beyond what humans are capable of hearing, which is generally 20-20,000 Hz. Sometimes you’ll end up with an inaudible part of your sub bass prematurely triggering your mastering limiter, or other plugins that respond to signal using a single broadband filter. It’s a little less likely for your top-end to trigger a device in this way since the energy of most songs decrease as you move up the frequency spectrum. For mastering purposes, I like using the Waves Linear Phase EQ due to the way it avoids creating a phase shift at the crossover points of the filters. 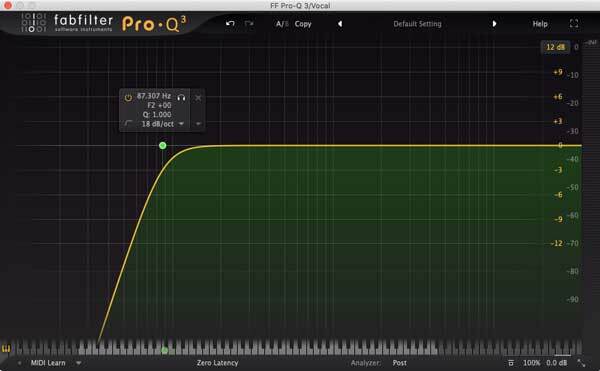 This EQ provides transparent results, which is precisely what you're looking for if you just want to cut away some low-end and some top-end. 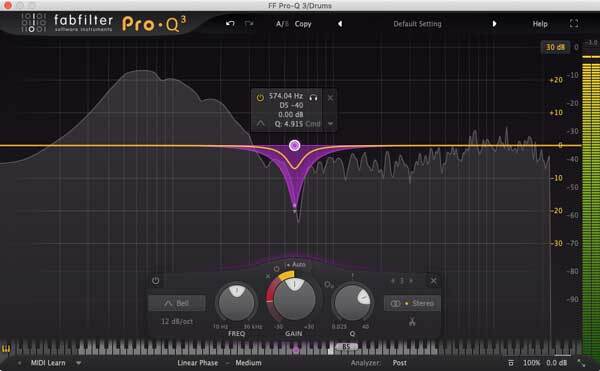 The FabFilter Pro-Q 3 also allows you to engage a linear phase mode, making it another strong mastering option. When you apply a high pass and/or low pass filter to your song, the goal is to remove only the frequency content that you can’t hear. As you increase the cutoff frequency of your high pass filter, bring it to the point at which you can just make out the effect it’s having, and then dial it back a couple Hz. 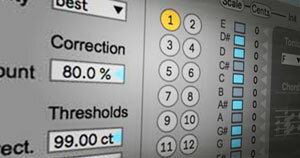 Try adjusting the filter’s slope to varying degrees, and select whichever settings sound the most natural; you can perform the same process using a low pass filter for your top-end. Figure 2: An EQ applying a high-pass filter at 30 Hz and a low-pass filter at 20 kHz. It’s incredibly important that you apply these filters using a system that’s accurately capable of producing bass down to 20 Hz. Many of the most popular speakers on the market can only produce frequencies down to 30-45 Hz, so the integration of a sub is likely required if you want to do this effectively; you could be missing out on more than an octave of frequency content without a sub. Alternatively, your headphones may be able to produce low end better than your studio monitors, so it’s worth looking up the frequency response of your headphones online. In Figure 2, I’ve applied a high pass filter at 30 Hz, and a low pass filter at 20,000 Hz. Keep in mind that these frequencies are where the frequency content starts to roll off; there's still information present below 30 Hz and above 20 Hz. In general, I think this a good starting point if you're looking to provide some added clarity to a mix, but make sure to listen critically to the processing you've applied. You're trying to remove information that you can't hear, so when you A/B the dry and wet signal, they shouldn't sound drastically different. I tend to avoid applying brick wall filters (filters with a slope of 0 dB/octave) in most situations since I think they sound unnatural. It's difficult to state when it is or isn't appropriate to use a brick wall filter since it's so situational. The best thing you can do is experiment with different filter slopes and decide for yourself what type of slope sounds the best for the material you're working on. In many situations, I find that using a shelf filter gets the job done, and sounds more natural than applying a cut. Sometimes you’ll be mixing a sound and notice a really harsh resonance. Resonance is mostly just a buildup of frequency content at a specific point in the frequency spectrum of a sound. Dealing with resonance is sometimes a simple fix, while other times it can prove to be a challenge; it depends how much resonance there is. Figure 3: A spectrum analyzer indicating resonance at F7 +29 (around 2800 Hz). The image above depicts the frequency response of a drum loop. The low-end is exaggerated due to the kick drum, which is to be expected, and the top end is relatively constant, but there’s a clearly resonant frequency at F7 +29 (around 2800 Hz). Before doing anything, you need to ask yourself if the resonance sounds subjectively “bad.” In this case, I’ve determined the resonance to be impeding the quality of the loop, so I’m going to apply some corrective EQ to deal with it. You’ll often hear sharp resonance as a whistling sound. While the resonance shows up quite clearly in the case of my drum loop, this isn’t always the case. You’ll often have to resort to frequency fishing to pinpoint the location of a resonant frequency. Frequency fishing involves drastically boosting the level of a bell filter and cranking up its Q value. This will create an incredibly narrow band that you can solo and sweep throughout the frequency spectrum as your audio plays. As you sweep the band, listen for frequencies that sound piercing and irritate your ears. Once you’ve located one of these frequency ranges, reduce the level of the band, and adjust the Q value until you’ve massaged the resonant frequency into the mix. Figure 4: A band that's been boosted and that's ready to sweep through the frequency spectrum of a sound to identify resonant frequencies. 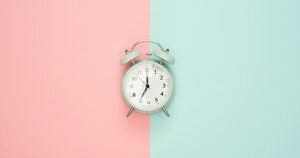 As soon as people find out about frequency fishing, they tend to over-use the technique. If you’re adding 5-10 steep notches to an audio signal, you’re either ruining your recording or the recording has so many resonance issues that you’re better off re-recording it. To prevent getting carried away, don’t bother with frequency fishing unless you can clearly hear resonance that needs to be dealt with. A run-of-the-mill EQ applies static level adjustments; if you apply a 3 dB cut at 2000 Hz, every sound, regardless of the level of the sound running into the EQ, will be attenuated 3 dB at 2000 Hz. This is often fine for individual instruments, but it’s not necessarily a great option when trying to apply surgical processing to a bus. A dynamic EQ will allow you to apply boosts and/or cuts to your audio signal in a way that is threshold level dependent. Suppose you had a client send you stems, but one of the stems was an entire drum bus containing a kick, snare, tom, clap, and hi-hat. If each time one of the toms hit, there was a resonant frequency, you’d want to attenuate it, but a static EQ cut would affect the other elements of the bus. 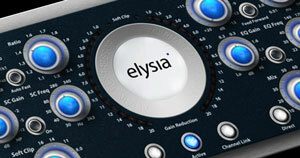 Instead of applying a static EQ cut, you could use a dynamic EQ to implement a dynamic EQ cut. Attenuation will only be applied to the signal when it exceeds the threshold level of the band you’ve engaged. This means that it will only affect your drum bus at certain points in time, which is perfect because you just need it to attenuate the resonant part of the tom when it plays. The FabFilter Pro-Q 3 allows you to right-click on a node and select “Make Dynamic” to cause it to respond dynamically to the input signal. The Dynamic Range Ring around the Gain knob controls the dynamic range of the selected band with a negative (compression) or positive (expansion) range; this value can also be set by dragging up or down on the arrows attached to the purple shaded area in Figure 5. 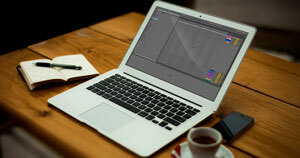 The current dynamic range level is visualized as a yellow bar within the dynamic range. Figure 5: A node in the FabFilter Pro-Q 3 that's been toggled into dynamic mode. Figure 5 is a bit of an extreme example of how you would use a dynamic EQ since the band is applying a fair bit of gain reduction, but visually it does a great job of explaining how bands operate in dynamic mode. If you’re familiar with multiband compression, you may be thinking that a dynamic EQ seems quite similar to a multiband compressor. 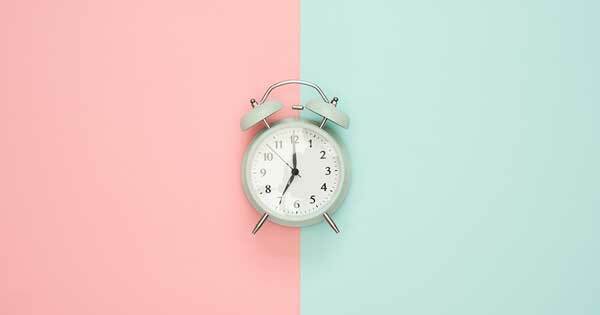 There are apparent differences between the two types of devices, but they’re much more subtle than you may think. 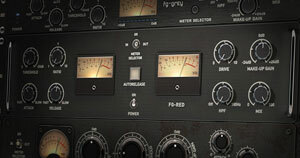 Read The Difference Between Dynamic EQs and Multiband Compressors to learn when it’s appropriate to use each type of tool. There’s one dynamic EQ, in particular, that’s become a favorite mixing tool of mine. 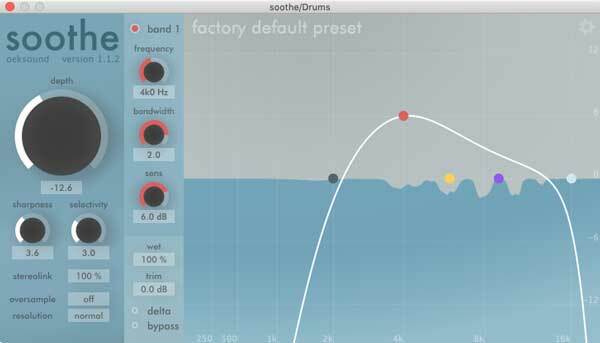 soothe is a dynamic EQ with self-adjusting frequency bands; this allows you to often bypass the need to manually set notches, making soothe a great time-saving plugin. It sounds great on vocals, but it works across a variety of sources. I’ve even used soothe while mastering since it's a quick solution to resonant mixes. Figure 6: soothe by oeksound. In a majority of situations, I’m not applying surgical processing to tracks or hard-cutting their low-end. 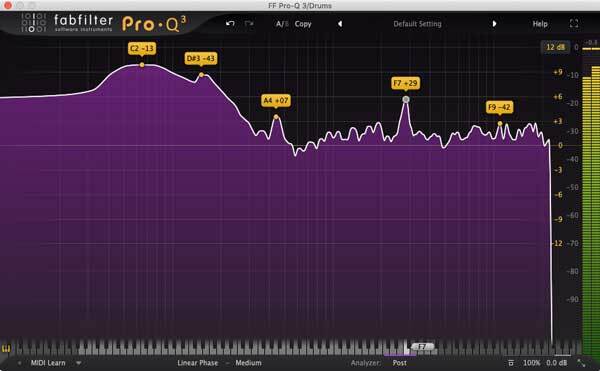 EQ advertisements show ridiculously exaggerated EQ curves that would rarely be used in a mix. There are, of course, no rules when it comes to mixing, but I can almost guarantee that you’re going to start creating subjectively better mixes if you cool it with the extreme EQ curves. The best way to test whether or not you've applied too much processing is to modify the Gain Scale on the EQ you’re using. This will dial back all the boosts and cuts you’ve applied, allowing you to compare your extreme settings with less extreme settings. Another great tip is to avoid EQing tracks when they're soloed. EQing a track, while soloed, doesn’t make much sense because you’re trying to “mix” it in with a bunch of other tracks. 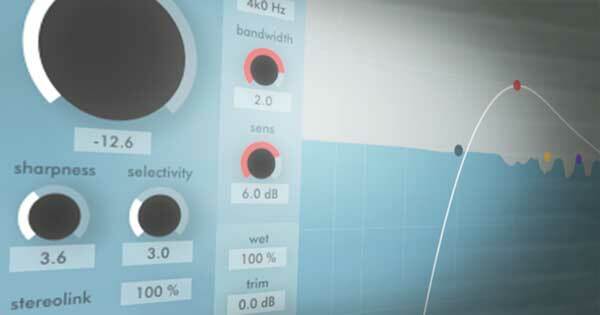 You’ll be able to get a better understanding of how the track you’re EQing is going to sound relative to the other elements in your song if you avoid hitting that solo button. "Nobody is going to listen to your main synth soloed," someone once told me, and it completely changed the way I went about applying EQ and other forms of processing like compression. It takes a little while to get used to applying processing in this way, but the results are well worth the initial discomfort. 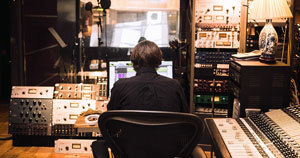 The two largest contributors to a clean mix are sound selection and arrangement. Before you even think about touching an EQ, you need to consider whether or not the sounds you’ve selected and the arrangement you’ve created are viable. 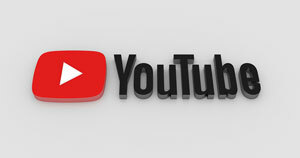 A lot of clients come to me thinking that I’ll just apply some processing to their song and it will all of the sudden sound great, but what we end up doing is taking a look at things like sound design and how they’ve laid out the elements of their song in relation to one another; it’s at this basic production level that a song’s mix potential will see the greatest improvement. 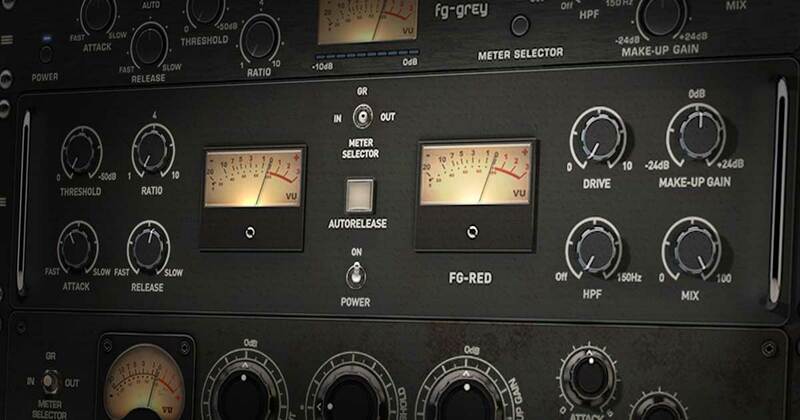 Read The 6 Secrets to a Clean Mix to discover how else you can improve your mixdowns.